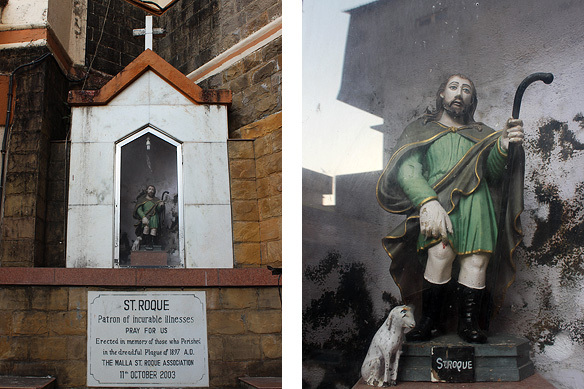 And for long [in my case] and for many [including me] these three comprised the Christian heritage of Bandra. But there is more. There is always more! Till Bollywood decided to make the neighbourhood a home for its stars and star directors, Bandra was a thickly wooded cluster of villages replete with small bungalows topped with tiled roofs, and mud pathways. These villages were: Sherly, Malla, Rajan, Kantwady, Waroda, Ranwar, Boran, Pali, and Chuim. Thirty years on, the chapel started to deteriorate. This time a Mr. Manoel Gonsalves of Malla Village chose to pay for its renovation and enlargement, as well as personally supervise the works. St. Anne’s Chapel opened its doors, prettier and a wee bit bigger, in 1896. The villagers expressed their gratitude with a permanent grave for Mr. Gonsalves inside the edifice. But there was one more metamorphosis the chapel still had to go through. In 1938, it was razed to the ground and a new building was put up in its place by Father Scipiao Braganza and his parishioners. In 1943 the little chapel on the hill came into its own and became an independent Parish Church. I had often heard about the church. 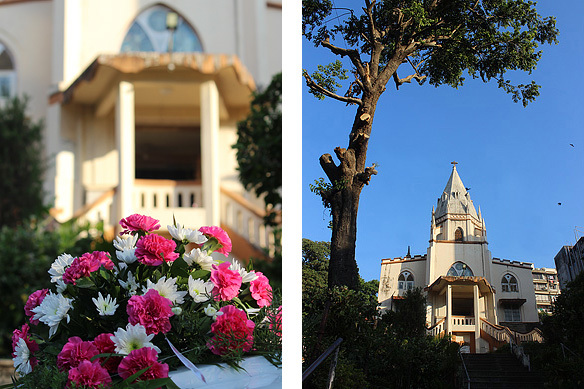 It was where the local Bandra-ites in and around Pali Hill got married, baptised, and buried. As a community, they gathered in its prayer groups and studied the Bible in their search for answers to life. Last weekend, I decided to make the journey from my hillock, to the Pali one. As expected there was a wedding ceremony on with men in silk suits, women in saris, and impatient children. Above the lilting hymns and baritone sermon, the church rose, serene and simple into the blue skies. St. Anne’s Church is neither grand, nor breathtakingly beautiful. It is instead charming, peaceful and quaint, built by the community, for the community over the past 158 years. The church is dedicated, as its name states, to St. Anne of David’s house and line—Anne is the Greek adaptation of the Hebrew name Hannah. So who was St. Anne? She was the mother of Mary and grandmother of Jesus. She is also credited with the Immaculate Conception, before Mary. After years of childlessness, she and her husband Joachim were visited by an angel who told them they would conceive a child. Anne promised to dedicate this child to God’s service. 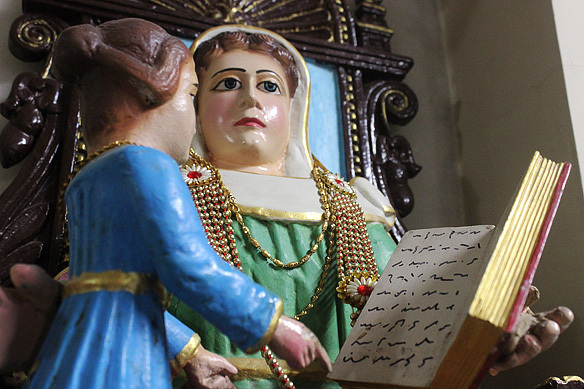 The Feast of St. Anne is celebrated with much pomp and merriment each year on 26 July in St. Anne’s Church. 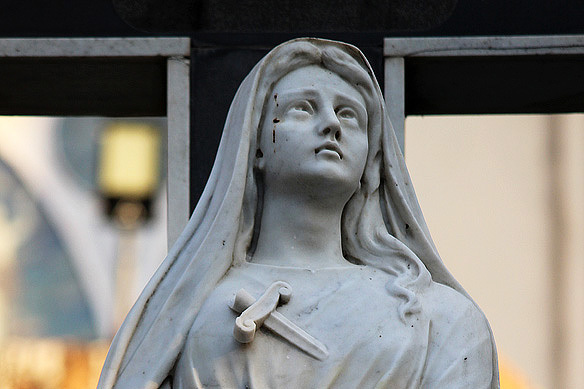 At the base of the steps leading to the main door stands a poignant sculpture of Our Lady of Sorrows, the Virgin Mary in a mournful state with her heart pierced by a dagger. It was gifted to the church by the Fonsecas from their private chapel, the Chapel of Our Lady of Calvary which was built in 1890. [The Chapel is now in ruins.] 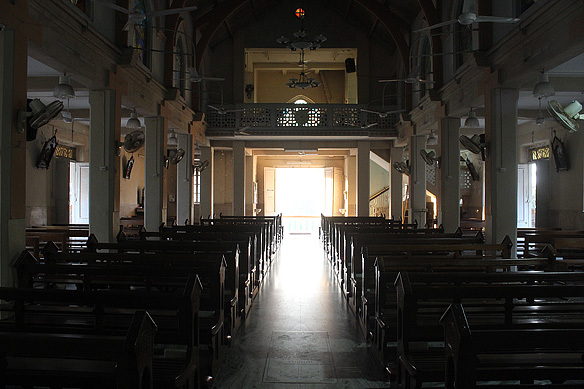 Local residents of Bandra have spent many a trip uphill to light candles and pray to Our Lady of Sorrows when it was housed in the Calvary Chapel. 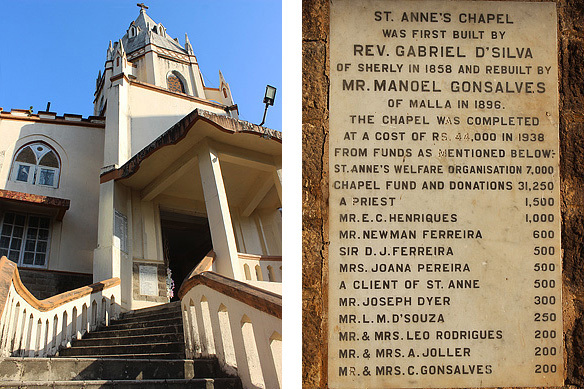 Other highlights to look out for are the replica of the Lourdes Grotto which greets the faithful at the gate, wall plaques dedicated to Father Diogo Gabriel da Silva and Manoel Gonsalves, and the brightly painted statue of St. Anne. 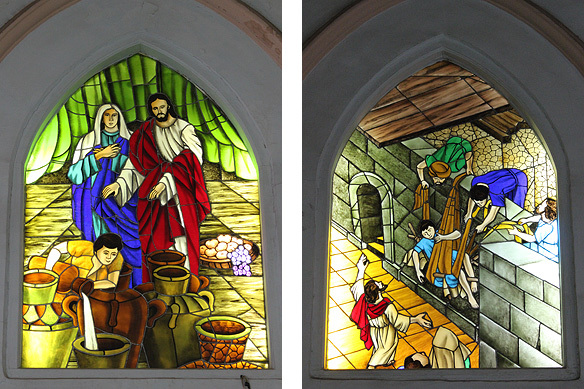 A renovated choir loft, dazzling stained-glass windows, and the Adoration Chapel, albeit pretty recent, are the contribution of Father John Lobo (2001 – 2008). Note: Whilst doing my research for this post I came across a couple of fantastic sites. To know more about Bandra and what makes it what it is, do read this. For further information about St. Anne’s Church you could visit their site here. Photography for this post was allowed with kind permission from the church parish offices. If you’d like to read my other posts on Bandra wherein I write about its much touted street art and the churches around the hillock I live on, check out my Exploring Bombay page. This entry was posted in Bombay aka Mumbai and tagged Bandra, Churches in Bandra, Pali Hill, Roman Catholic Church, St. Anne, St. Anne Parish Church by Rama Arya. Bookmark the permalink. I doubt that I will ever be fortunate enough to visit |Bandra, but thanks to you, I really enjoyed this guided tour. The pleasure is mine, janettoms! It is wonderful to know that what I write is being enjoyed. 🙂 Thank you. Thank you, Hálice Freitas. 🙂 Appreciated. Beautiful photos and history. Thank you for giving me the chance to explore the chapel through your writing. And beautiful pics you have added. This looks like a very beautiful and peaceful place. Yes, it is, Jodecouvre. 🙂 Charming and serene. Pls do check out my blog. Very well expressed..Good one ! I am good, suroyoms. 🙂 Trust you are well too. Thank you for stopping by at my blog. Hi, this is an interesting read, however please note the Chapel you mentioned at Calvary is not dismantled but it is currently in ruins. 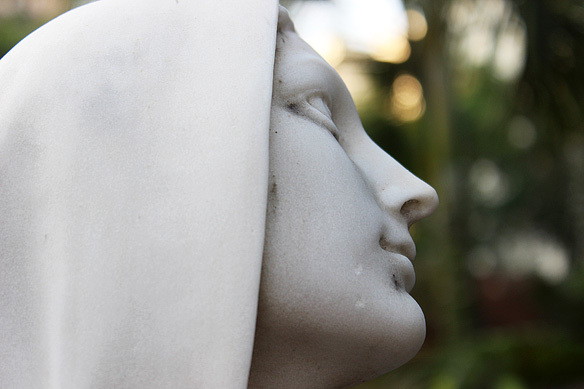 The Statue of Our Lady of Sorrows was gifted to the Parish of St. Anne’s but there has never been anything heard of related to magical powers, would be good if you can take off that line. 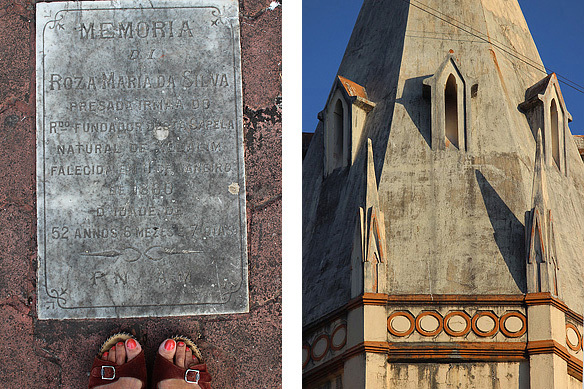 My grandmother was a Fonseca and often told us stories of the place, so i can vouch for the above.